I think last night I might have officially lost any hope for becoming “Mother of The Year.” In fact, I might have put myself into a Joan Crawford-like category for “Crazy Mother of the Year." It all started after picking up my youngest daughter from volleyball practice after school. I dropped her at home to get her homework done while I went to an afternoon yoga class. In addition to doing her homework, I reminded her to bring her dirty laundry into the laundry room and tidy-up her room. She had two hours to accomplish these three tasks. Then she would basically free to do whatever she wanted with the exception of watching TV (which we really try to limit during the school week). As she headed towards the bathroom, I asked her if she had brought her dirty clothes into the laundry room yet? Nope. “Did you tidy your room yet?” Nope. You can see where this is heading. I took a deep breath, fed the dog, sorted my own laundry, started cooking the pasta and setting the table. Even after all of that, my daughter was still not out of the shower. So, I decided to see what was taking so long. I was hopeful that she was busy tidying-up her room and gathering her dirty laundry. But as I approached her room, and then the bathroom, I could still hear the shower running. Not good. I felt my inner-control-freak start to awaken. I turned the corner and could see that she was still in the shower and, at the back end of the shower, was a clear plastic bag hanging from a towel hook. Inside that plastic bag was her iPhone playing an episode of cartoons on Netflix. Yes, she was watching television IN the shower on her iPhone. No, she is not allowed to watch TV during the week. Yes, she was supposed to be taking a “quick” shower. Yes, she was supposed to be cleaning her room. Yes, she was supposed to be bringing her dirty laundry into the laundry room. Let’s not even mention the fact that was wasting water… a ton of HOT water no less. To say “I lost it” would be a gross understatement. I overreacted in such a profound way. I was screaming. (Maybe at the top of my lungs.) ARE YOU F*ING KIDDING ME?????? I know. I know. I said the F-word. To my 13-year-old daughter. I thought about it when the words came out of my mouth. I know this is very, very bad. But I bet a Child Service caseworker would side with me if they had a teenager too. While I continued to rant (uncontrollably) about how this was totally unacceptable, I grabbed her phone (in its protective plastic shower case) and proceeded to get down on the floor, crawl under her bed, and pick up her dirty socks. Then I proceeded to collect her dirty underwear, dirty tennis clothes, dirty volleyball clothes, dirty school uniforms and a ton of other clothes. Clothes on the bed. Clothes on the floor. Clothes in the hamper. Clothes next to the hamper. Clothes on her bookshelf. Clothes on her desk. Piles of clean clothes that I had washed (the Sunday before I left), were still neatly folded under dirty clothes that had been thrown on top of them. I then proceeded to sort through five loads of laundry. Yes, every week, there are five loads (not including sheets and towels) of laundry, because we all do sports. But here's the thing, I didn’t have any dirty laundry this week because I was in LA and did my laundry there. So why am I literally waist high in dirty laundry on this Monday night? Because, in my absence, my daughter must have decided to change her clothes three times a day and everything ended up on the floor. Whether it was dirty or not. By the time I got the first load into the washing machine, checked on my pasta (which was slightly overcooked at this point), my teenage daughter was dressed, standing in the kitchen, and trying not to cry. 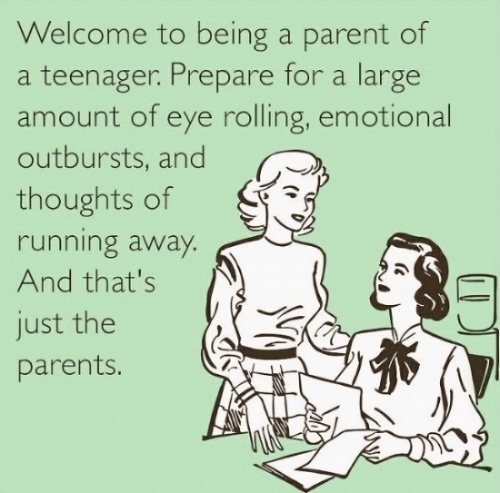 Having been down this road with two kids already, I’ve come to realize it’s always a little bit of an unknown if teenagers cry because they genuinely feel remorse for not following the rules. Or if they cry because they got caught doing something they weren't supposed to be doing. Or if they cry because they just lost their cell phone privileges. I would like her to monitor her own homework. I would like her to tidy-up her own room (without being reminded). With any time left, she is free to watch TV (on the weekends), Snapchat, Instagram, play on her phone or hang out with friends. At this point, her Dad jumped in and reiterated the importance of making her bed, keeping her room tidy and making her school work her top priority. He then decided to take this opportunity to point out that her mother (me) is a “neatnik.” While he never expects her to live up to “my” standards of “neatnik-ness,” she must do the bare minimum. Somehow the life lesson that I was trying to teach got turned into a mockery of what might be considered my tendency towards obsessive-compulsive behavior. (I suppose there is some truth to that, but it is also those qualities that were currently getting the laundry done and dinner on the table too.) They both had a good chuckle at my expense and dinner was served. After dinner, my daughter went back to her room to print out a paper for school. I finished doing the dishes and then went to help her with her remaining algebra problems from the night before. When I walked back to her room, she was passed out on her bed with the lights on and on top of the covers. It was only 7:30 pm. I insisted that she was “fake sleeping.” This was clearly avoidance behavior, because she had gotten in trouble, and didn’t want to work on her math. I stood over her like an insane drill sergeant commanding her to wake up and finish her homework. I waited and waited. She didn’t move. I checked for a pulse (no seriously, I did). She was fine, but I still thought she was faking. So I turned off her lights but took her computer out of the room. I came back at 9 pm (her actual bedtime) and she was still asleep and curled up in the EXACT same position. Still no blanket. Hadn’t moved an inch. I put the blanket on top of her this time and said goodnight. She slept through the night until I woke her out of a dead sleep at 6:30 am for school. She had slept for 11 straight hours and didn’t remember anything after she went to her room and printed her paper. So she wasn’t fake sleeping. She wasn’t ignoring me. She was just exhausted. Probably exhausted from playing in a tennis tournament over the weekend. Exhausted from a long day at school and then volleyball practice after school. Then two hours of homework. Then a lunatic mother screaming her head off, because she shouldn’t have been watching TV (in the shower no less), when she should have been doing the minimum of her chores. After a big lecture, followed by a comfort food dinner, she simply passed out. She is 13-years-old and has grown five inches in the last year... and she is tired. Everything was back to normal today. She gave me a big hug when I dropped her off at school and we both said, “I love you.” I have to remember that sometimes kids just want to be kids (which includes watching mindless cartoons when they should be doing their chores). And sometimes moms lose their sh*t because we are trying to keep it all together... while buried in dirty laundry.